A new framework to bring about a more holistic approach to the country’s food economy will change the farmer-government relationship on how future agri-environment schemes will work, the Defra secretary has said. Michael Gove speaking at the CLA Rural Business conference, Westminster. 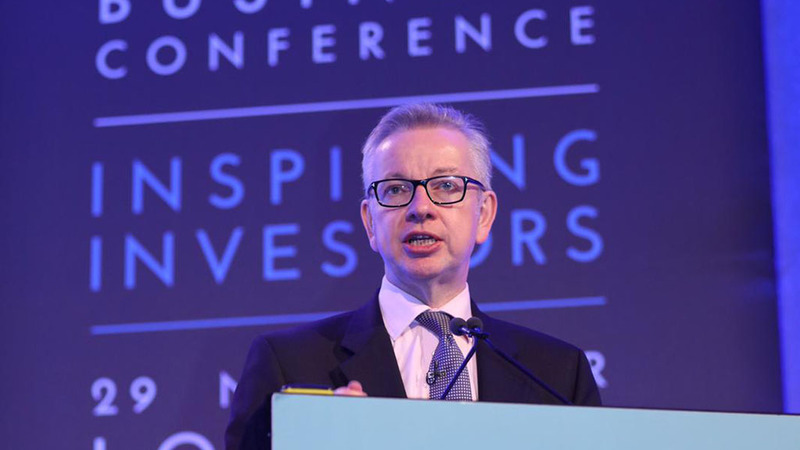 Michael Gove addressed the CLA’s Rural Business conference yesterday (November 29) with a pledge that farmers would be better communicated with on environmental and land management schemes, set out in contract form with an agreement the Government would adhere to. He admitted the current system administered by Defra had been ‘clunky and cumbersome’, with the Basic Payment Scheme (BPS) a payment which had ‘dampened productivity but at the same time not properly rewarded farmers for all of the public benefits and broader social goods they generate’. Mr Gove said: “We owe our farmers and rural businesses, and we owe them big time. Which is why we want to introduce as it were a fourth crop, an alternative source of income for the future, and these are environmental land management schemes. “One of the things that has come through loud and clear is that there are problems and deficiencies with the existing way in which we pay through countryside and environmental stewardship for the environmental goods that you generate. Instead, the new contracts will reflect the commitment to long-term investment that farmers and landowners will need to make, being more flexible both in the way they are designed and also in the way farmers can choose the date and time in which they join. “One thing we can also learn is that you need a degree of certainty in order to plan for the long term in a genuinely thoughtful way,” Mr Gove said. “Which is why these Environmental Land Management (ELM) schemes need to be contracts of the kind that you might enter into with someone you are supplying the other crop to, and just as you would enter into a farm contract with a merchant or with a processor. Henry Dimbleby, entrepreneur and investor at Leon Restaurants, who is heading up the National Food Strategy review, added: “How climate change will impact what land produces means that we need to set a new national framework – built on the Agriculture Bill – to say what do we need to do to create a food system that delivers healthy, affordable food to everyone regardless of where they live and what they earn.